Women representing South Korea and more than 16 other countries gathered this week in Seoul for the #WomenPeaceKorea symposium and Women's DMZ walk. When scores of Korean women representing a coalition of some 30 peace groups and NGOs entered South Korea’s National Assembly on the banks of Seoul’s Han River, they weren’t alone. This week, the Korean peace makers were joined by an international delegation of women peace activists for a symposium focused on ending the Korean War. A women’s peace walk along the Korean Demilitarized Zone (DMZ) is scheduled for May 26. When women participate in negotiations, the likelihood of achieving peace increases substantially and that peace lasts longer. 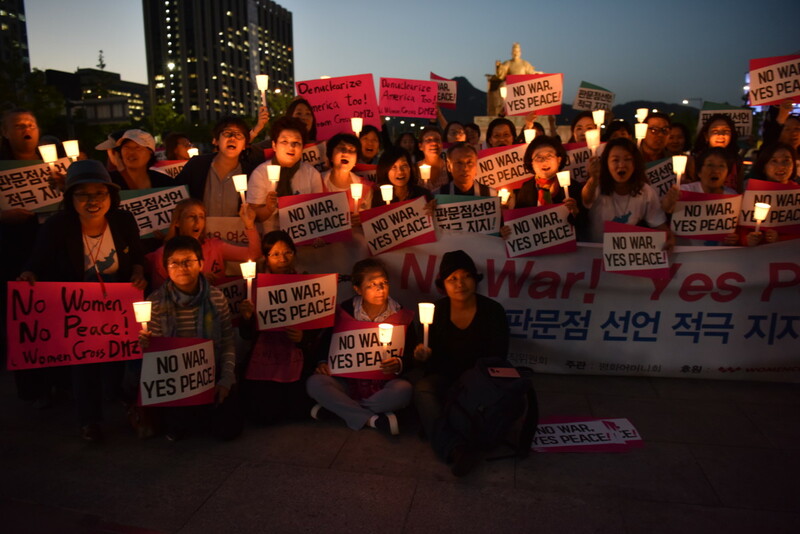 For the fourth time since 2015, these activists gathered to strategize how to most effectively advance peace on the Korean Peninsula and support diplomatic efforts to that end. #WomenPeaceKorea delegates’ efforts include engaging with South Korean government officials, foreign diplomats and US embassy officials. Most of the international delegates are members of Women Cross DMZ and the Nobel Women’s Initiative who have traveled to Seoul to lend their support and raise awareness of the vital role women play in ending conflict. Multiple studies have shown that when women participate in negotiations, the likelihood of achieving peace increases substantially and that peace lasts longer. Ahn Kim Jeong-ae, one of the symposium’s organizers, said the diplomatic thaw between North and South Korea makes this week’s events even more crucial. Because women suffer disproportionately in war, they have a critical role to play in conflict resolution. Ahn Kim noted that 2018 marks the 70th anniversary of the establishment of separate governments in Seoul and Pyongyang. This spring was also the 70th anniversary of the April 3 incident in which some 30,000 civilians on South Korea’s Jeju Island were massacred over a seven-year period when US military-backed right-wing forces violently purged opponents of a divided and occupied Korea. “We want to commemorate these historical facts on May 24, International Women’s Day for Disarmament and Peace,” Ahn Kim said, noting that because women suffer disproportionately in war, they have a critical role to play in conflict resolution. Unlike in 2015, when Women Cross DMZ was barely acknowledged by South Korea’s Ministry of Unification, this year’s symposium was financed by the South Korean Ministry of Gender, Equality and Family, Ahn said. The difference reflects a dramatic change from the administration of deposed South Korean President Park Guen-hye to the progressive administration of current President Moon Jae-in, who favors engagement with the North. With the proposed Trump-Kim summit summarily cancelled by Trump on Thursday, Ahn said women’s participation is even more essential to reframing what security actually means. “We need to define security in far different terms than the militarized national security,” she told Truthout. Aiyoung Choi, who was born in what is now North Korea, today serves on the Women Cross DMZ steering committee. She’s heartened to have the support of women peacemakers from countries as diverse as Canada, China, Russia, Iraq, Colombia, Kenya, Japan and the Philippines. 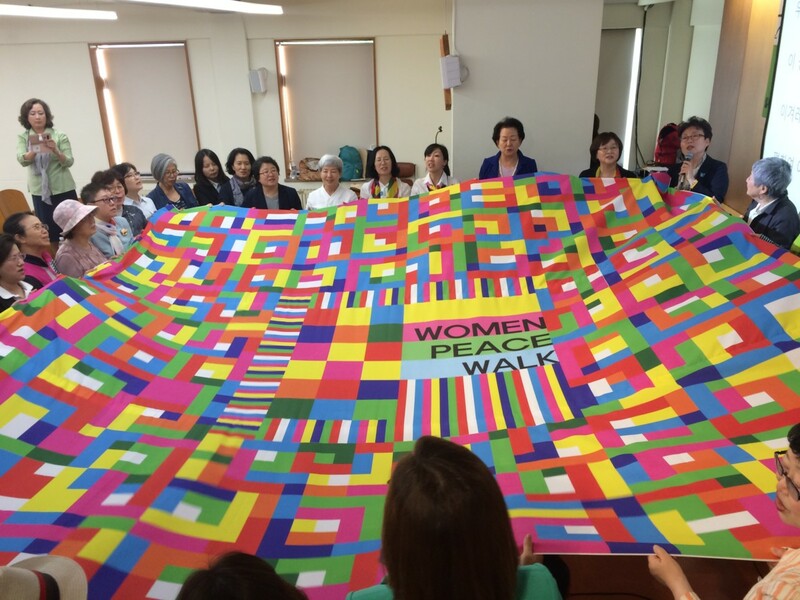 Women hold a quilt symbolizing peace and unity between people on the Korean Peninsula during last year’s women’s peace symposium in Seoul. Among the women who traveled to North Korea in 2015 to meet with North Korean women before crossing the DMZ was Nobel Peace Prize laureate (1976) Mairead Maguire, from Northern Ireland. As she prepared to return to Korea this week, Maguire told Truthout that the international delegates’ role was to listen, learn from and support Korean peacemakers. Making peace is a process, and it takes time and it takes courage. “We also come with a certain amount of experiences in our own situation where peace has worked for those of us who come from certain areas,” Maguire said, citing her own work to end the violence in Northern Ireland in the 1970s. Recounting the 2015 trip, Maguire recalled how she was struck by the intense yearning for peace expressed by the thousands of North Korean women they met at rallies in Pyongyang and Kaesong. Those women, Maguire explained, wanted to reunite with family members on the other side of the DMZ. “Peace is possible and the civil community has a role in helping to build that peace and to support political leaders who show courage to try to make peace, but you can’t leave out the civil community and particularly women,” Maguire told Truthout. “Making peace is a process, and it takes time and it takes courage. And it takes people to constantly sit at the table and to be prepared to compromise and to listen to each other and find solutions,” Maguire added. “Because women are burdened with the daily aspects of occupation or armed conflict, I think we have a lot more at stake for making sure that peace processes actually are put in place and they actually work,” she added. She pointed to peace efforts and mass mobilization by women in Liberia as a prime example of how they can help end war, but added that the role of men cannot be discounted. “Obviously, it’s a joint effort … the reunification question, in a very fundamental way, is about reunifying families that have been separated since the split,” she said. Okazawa-Rey cautioned that peace talks should not be limited to high-level diplomatic talks and spoke of the need for a range of dialogues at every level, including citizen diplomacy. “Let the people in on some of the action,” she told Truthout. Having reached this historic moment in Korea, Okazawa-Rey praised the ambitious goals of the Panmunjeom Declaration for Peace, Prosperity and Unification of the Korean Peninsula, signed by Kim and Moon at the DMZ on April 27. “It has to be bold. It has to be super-idealistic to help people imagine possibilities, to imagine a certain kind of generative direction that the Korean people should be headed toward,” she said. Among its many stated targets, the Panmunjeom Declaration calls for an end to division and confrontation, intra-Korean contacts at all levels and replacing the armistice with a final peace treaty to formally end the Korean War. Two of the international delegates in Seoul this week came from Pacific islands that have firsthand experience with the threat of war with North Korea: Hawaii and Guam. This potential for hope and peace has been laid down brick-and-mortar by the Korean people themselves. Kalamaokaaina Niheu is a family doctor on Oahu whose own family has a long history of fighting for justice in the Pacific. With a Kanaka Maoli (Hawaiian) father and Korean mother, Niheu feels a deep sense of solidarity with both places and recognizes how each has been impacted by colonization and militarization. But women have been notoriously pushed to the side for many centuries, according to Niheu, who said she sees an increased recognition of the invaluable and intrinsic contributions women make, not just to creating peace, but to creating lasting peace. Also in attendance was Lisa Natividad, president of the Guahan Coalition for Peace and Justice. In 2015, Natividad was part of the Women Cross DMZ delegation that traveled to Pyongyang, where she witnessed the heartbreak North Koreans expressed, longing for family members across the DMZ. Before he called off the scheduled June 12 summit in Singapore with North Korea, President Trump, who frequently boasts about being pro-military, had suggested “everyone thinks” he deserves the Nobel Peace Prize. Let Trump preen so he can get out of the way of the real work.